I have always wanted to make my own homemade tortillas, so a couple of weeks ago I finally ordered a tortilla press and bought some masa. Turns out that's all you need to make delicious homemade tortillas. You don't even need a lot of time. In fact, in less time than it would take me to drive to the nearest grocery store, buy them and drive home, I had read the instructions, mixed the dough, pressed them, and cooked sixteen beautiful and delicious tortillas. Why did I wait so long to try this at home? 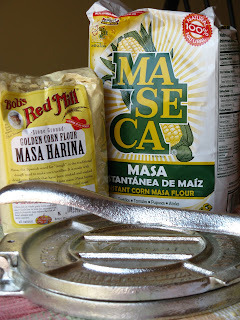 Most bags of masa harina, a flour made from corn, have a recipe or two on the back instructing you how to make tortillas for tacos, tostadas, or gorditas. I used the proportions below for the stack shown in the picture. Then I heated them in a cast iron skillet and stored them to be used for tacos and burritos. Wrapped tightly in a zip bag, they will keep a few days in the refrigerator and longer in the freezer. But they are so good, you'll want to eat them, not save them! Cinco de Mayo is just around the corner. Making tortillas would be a great way to celebrate -- especially with a make-your-own taco or burrito bar. You provide the masa, the tortilla press and the skillet. Have your guests bring chopped and prepared ingredients to fill the tacos or burritos. Add some cervezas and margaritas and it's fiesta time! Mix all ingredients for about 2 minutes, until a soft dough is formed. More water can be added, if dough feels too dry and will not stick together. Divide dough into sixteen balls and cover with a damp cloth. Line the tortilla press with two sheets of heavy plastic wrap (I just used two pieces of waxed paper cut to fit between both the flat sides of the press and the dough ball), so that the dough will not stick to the press. Press and carefully peel the tortilla off plastic wrap or waxed paper. To cook, preheat and ungreased griddle or skillet on medium heat. Cook tortilla on one side for 30 seconds, flip and cook for one minute, flip again and cook for another 20 seconds. Cover with a soft cloth to keep the tortillas warm and pliable. After cooling, tortillas may be fried for making other Mexican favorites such as hard tacos, tostadas, or quesadillas. What a great idea! I don't have a tortilla press (or plans to get one :( ) but I wish I did! I'd make these in a second. Tortilla chips and salsa are always a big hit with my friends. Maris, you can "smash" these out by hand, if you have the time, but the press is inexpensive and doesn't require much storage space. Or just buy great fresh tortillas and make you own chips and salsa -- you're the winner either way! Oooo, and your margaritas are soooo good! Dawn, this would be great fun for your little ones in the kitchen! You are now putting all of us to shame! (And I've always wanted an excuse to buy a tortilla press...) Love your photo of the tortillas, too -- so evocative. Okay, I'm impressed. Never even seen this being done. Oh, Lydia, I think I like being evocative! My brother in San Diego liked this picture too. Thanks to both of you. Kalyn, I'm beginning to think I should have bought stock in tortilla presses. It really is so easy. I love my tortilla press. The kids and I use it often. These looks so easy and so delicious. And this post reminds me that I want to have a Cinco De Mayo party. There are also electric tortilla presses that cook the tortillas as they press them. We have one of those and they are great. Here is a link in case you are interested. Fun project. I bet the homemade ones are delicious. I need to try this. Morel Season - The Hunt Is On To Eat Locally!